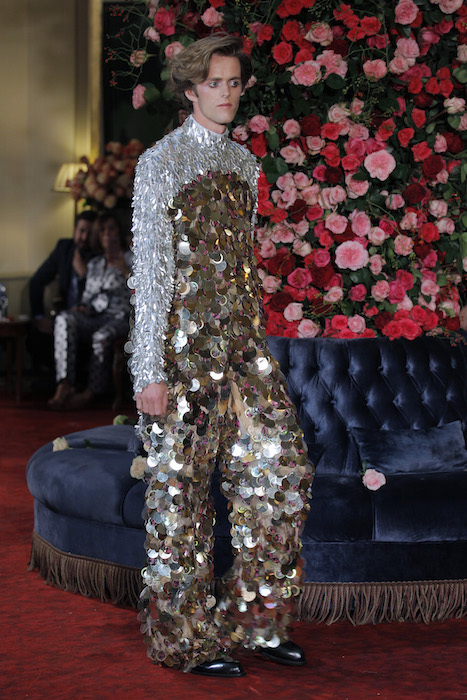 Another sparkled and feathered showing in Madrid, with sweetheart Palomo Spain showing in the Wellington Hotel during MBFWMadrid. The no gender collection we’ve grown to love started just about a year ago when we discovered it at NYFW:M in New York, and now showing all over the world: Moscow, Madrid, and Paris. The latest “Palomo Hotel” collection is journey from the lazy sunrise to the exited sunset. The designer presented 67 looks ad had a surprise of a few familiar fabs on the runway including Rossy de Palma, Samantha Vallejo Nájera and Maria Fitz-James. In the audience, the likes of the fantasitc Pedro Almodóvar, along with Eugenia Martínez de Irujo, Hiba Abouk, Carmen Lomana, Susanna Griso o Raquel Sánchez Silva, and Lindsay Lohan came to support the designer’s fantastical journey. Here is a glimpse of the fabulous and sparkled on guys and girls. yay. ANOTHER wonderful showing from this uber talented designer! PALOMO SPAIN genderless fashion spring 2018 commentary and faves by Brigitte Segura.